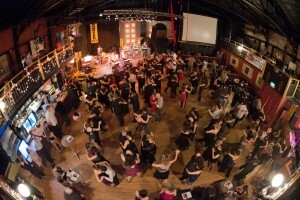 Are you planning a Tango Trip to San Francisco? 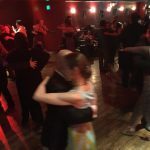 If you are looking to dance in one of the best US cities for Tango, this guide is for you. Most of the milongas are located in the Mission district of San Francisco with the exception of a few in the East Bay or Marin. Below is a map of some of the most popular milongas and practicas in San Francisco, Marin, East Bay and South Bay. The Mission, always known for its share of Latin Americans, artists and hipsters has recently become a hot spot for hip new restaurants, bars and cafes. 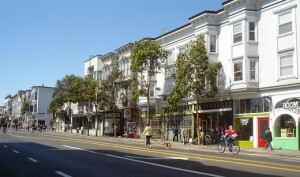 On Valencia Street you’ll find a plethora of great places to eat, drink, shop and people watch. Do keep in mind, not the entire Mission is gentrified, and a few areas are little unsafe, especially near the Bart stations, so please use common sense and be aware of what’s around you and of your belongings. 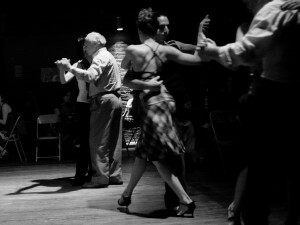 Also, make sure to visit tangomango.org to see a full listing of all Tango events for each day of the week. Which Milongas/Practicas are the most popular? 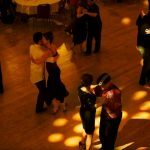 This answer is very subjective, and depending on your style of tango, you may prefer one milonga over another. 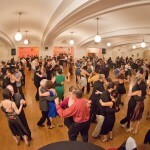 A good idea is to ask someone whom you enjoyed the dance, which venues are their personal favorites. You have a few options when looking for lodging in the city. You can do the standard route and find a hotel. Most hotels are located at Union Square, a very central location near public transportation, shopping, theaters and dining. Yelp’s list of inexpensive hotels here. If you plan to stay for a while and want a more home-like experience, or just a better deal, a great option is to rent a room or apartment with airbnb.com. Airbnb offers a variety of lodging options from a room in a house to a whole apartment. Neighborhoods to look for that are close to the Mission include Noe Valley, Castro, Bernal Heights, Potrero Hill and SOMA. 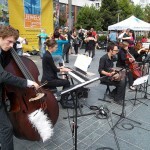 And if you are true Tango vagabond, you can also CouchSurf. If you are staying in the city, you won’t need to rent a car. But if you do have a car, parking can sometimes be quite challenging or expensive. However, near the milonga’s in the Mission, parking on the street is usually free, if you can find a spot. The BART: Taking the BART is a quick and easy way to get around the Bay Area and it goes directly into the Mission, near many of the milongas. A trip within the city is only $1.75 (one way only). The Bus/Train (MUNI) : These run all over the city ($2.00 includes transfer). The downside is that the bus can be slow and can often make for an interesting adventure, especially if they are crowded. Go to 511.org or download the Transit App if you have a smartphone for door to door trip planning on Muni and the BART. The ever famous SF Cable Cars, while fun, ARE NOT a viable option for getting to milongas. They ARE an option for site seeing during the day, if you don’t mind waiting in line with many other tourists. You can either call a cab or flag one down (but this only works if you are on a main street). Can I go by myself? Should I bring a partner? 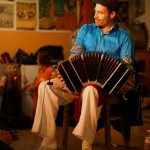 Dancers enjoy the live music of Seth Arsanow Y Su Sexteto at Broadway Studios. Yes, you can go by yourself to both the milongas and classes and no, you don’t need to bring a partner. Actually, going alone will usually help you to meet people. At some of the milongas or practicas, if you are an out-of-town visitor, the host will introduce you during the break for announcements. 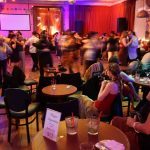 Here in SF, we like visitors, so definitely introduce yourself to whomever you dance with and they will often introduce you around to the regulars at that milonga. 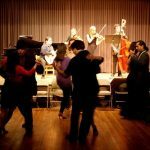 Take Private Lessons: Read about Bay Area Tango Instructors here. 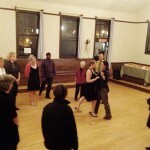 Also, check tangomango.org to see if any visiting teachers are in town. If you have a favorite Bay Area teacher, make sure to book ahead with them before you arrive to make sure they are available. Shop for Tango Shoes: Quite a few people sell Tango shoes here in SF. Visit the Tango Shoes page for a list on where to buy shoes in San Francisco. 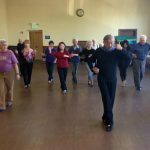 Studio 1924 in Oakland – has lunch time classes as well as evening classes. North Beach – pretend you are in Italy! Lower Haight – cooler than upper Haight with great bars and cafe’s. Japan Town – Japanese shops and food … need I say more? Go hiking! Visit the Ocean! Walk the museums! Get lost in Golden Gate Park! And make sure to save your energy for dancing at night.